The cultural difficulties of bringing DevOps to the mainframe. Companies are under pressure to innovate faster, keep up with customer demands and fight off the ever-increasing competition. This is especially true for large enterprises, which remain heavily reliant on the mainframe to power critical processes and transactions. A Forrester report found that this year, 64 per cent of organisations with a mainframe will run more than half their critical business applications on the platform. However, with 10,000 baby-boomers reaching age 65 every day between now and 2030, the availability of developers with specialist mainframe skills is becoming scarcer. Modernising mainframe software development and delivery so it can support the changing needs of the business is understandably a major priority for IT decision makers. Increasingly, organisations are realising that they need to include the mainframe in their DevOps journey. By doing so, they can supercharge their digital transformation by fully harnessing their most business-critical data and applications along with the mainframe’s proven stability, security and resilience. However, as with most things in life, it can be easier said than done to bring the mainframe into the DevOps fold. Though there are many benefits of bringing DevOps to the mainframe, it’s not always easy to gain the support needed from the wider business to treat it as a priority. Decision makers may be hesitant to disrupt what they consider to be a stable running organisation. They prioritise the status quo and maintain business as usual, rather than taking the risks often associated with change. Traditional mainframe teams are organised in silos, and team members often believe that quality will be sacrificed if they are asked to deliver faster. Myths and misconceptions about so-called legacy systems can also deter distributed systems developers from wanting to get involved with the mainframe, which can create a perception of ‘us and them’ between teams. This can be very difficult for IT leaders to overcome and know how best to persuade their teams of the importance of working together to involve the mainframe in DevOps. This difficulty mainly stems from the organisational change that has to take place for DevOps to succeed. It’s only human to resist change; we are creatures of habit. Therefore, it’s natural for teams that have been working in the same way for many years to perceive this change as disruptive to say the least. More experienced mainframe teams might be asked to relinquish responsibilities, hierarchies and methods that have been in place for decades. Distributed teams will need to learn to work on an unfamiliar platform that they’re often reticent to accept. Challenging the status quo, while knowing many members of the team could be reluctant to change is a daunting proposition, but a business can only be as fast as its slowest system. Breaking down silos and encouraging organisational change to help integrate the mainframe into the IT mainstream is therefore crucial to achieving the benefits of DevOps. 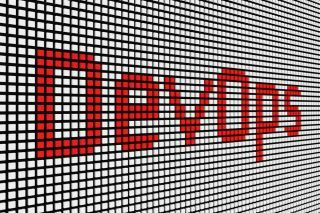 Despite the challenges, there are several steps that can increase positivity towards DevOps. Cultural change within an organisation is often the biggest hurdle to achieving successful DevOps, and it isn’t something that can be fixed overnight. Substantial change requires new tools, processes and structures to be in place first, helping to ease the transition for any resistors and enabling culture to evolve naturally over time. A small yet impactful place to start is to modernise the mainframe development environment and tooling. One crucial first-step would be introducing new tools to replace outdated green-screen environments with modern, intuitive IDEs. This would help less experienced programmers to work on the mainframe more confidently. Another step towards enabling integration of the mainframe into wider DevOps processes is using tools to automate complex, repeatable processes like testing. Putting these new tools in place enables mainframe and distributed teams to work in similar ways. It will lay the foundations to stimulate a natural evolution of an organisation’s culture, paving the way for DevOps to be truly successful. While organisations can’t afford to alienate newer programmers from the mainframe by expecting them to work with antiquated tooling, they similarly need to cater for experienced developers. It can ease the process of bringing DevOps to the mainframe if organisations combine an intuitive IDE for those new to the mainframe with a green-screen emulator for longer-serving developers. Additionally, senior management must also take into account that buy-in from the very top of the company is also key in the mission to bring DevOps to the mainframe. Leadership across distributed and mainframe teams must coach people at every level on why the company is implementing cross-platform DevOps – looking at how it will be achieved and the benefits it brings. This will foster faith that, though it requires adjustment, it’s happening for a good reason. After the right tools are in place, starting small with a single project that brings a cross functional, agile team to the mainframe also builds trust, demonstrating the value that can be achieved and giving IT leaders a better chance of ‘selling it’ to wider IT teams. When mainframe and distributed teams are clear with their roles, working with similar tools and working towards a shared goal, they are much more likely to feel equal and be fully engaged. Initiatives like developer book clubs and discussion groups can also help – taking the educational process and making it a sociable group exercise to promote idea-sharing and collaboration. Ultimately, it’s no longer a case of “big beats small”; now “fast beats slow” in any industry. Businesses need to innovate faster to keep up, and those that succeed in bringing DevOps to the mainframe will be able to do just that – accelerate development to better serve customers and maintain competitive advantage. It may seem difficult to usher in the change that’s required, but there’s no reason that DevOps can’t work just as successfully on the mainframe as it does in other environments, even if the transition may face resistance. The benefits in the long-term far outweigh any teething troubles in the short-term. With a truly cross-platform, collaborative DevOps culture, mainframe code and data can begin to be fully leveraged to drive the business forward faster than ever before.